Octopus can be a daunting ingredient to approach for the first time, but once you master it you'll understand why its distinctive, delicate flesh is eaten all over the world. While naturally quite tough in texture, octopus can be deliciously tender when prepared carefully - take a look at our guide for more advice on how to cook octopus before you begin. Michael Wignall creates an octopus terrine to serve with his Langoustine ceviche recipe, while Selina Periampillai opts to finely slice her cooked octopus and toss it through a spicy dressing for a delicious Octopus salad. Given the striking appearance of octopus tentacles many chefs also choose to serve them whole, creating a finished dish with real visual interest. 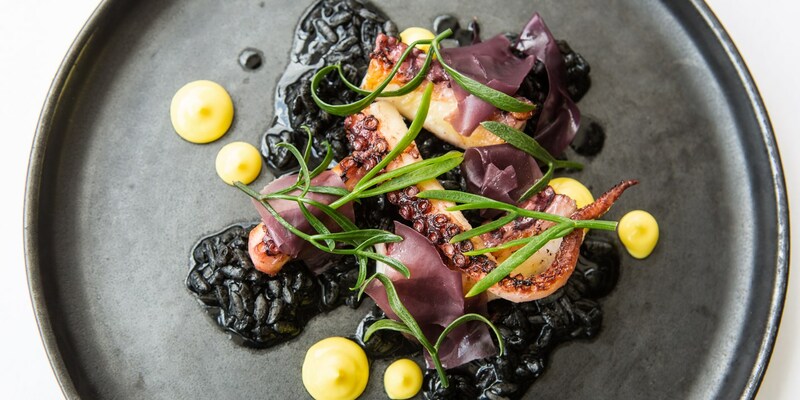 Steven Smith uses a water bath to slow cook his octopus for five hours in his Octopus and shellfish wonton recipe, while Paul Welburn's stunning Octopus, 'black rice', saffron recipe make an unforgettable seafood risotto.